Updated: All the Snapdragon Samsung Galaxy S7, S7 Edge, and S7 Active variants can now be updated to Android 8.0 Oreo based on Samsung Experience 9.0. The full stock firmware falshable via Odin is now available for the AT&T, T-Mobile, Sprint, Verizon S7 and S7 Edge variants. Whereas, OTA updates are now available to update S7 Active to July 2018 Android Security Patch. Samsung’s flagships phones are now officially out of Oreo Beta Program and receiving the official Android 8.0 firmware update. The Samsung Experience 9.0 firmware is now rolling out for the Galaxy S8 and S8 Plus international variants across the globe. Soon after the stable version as released, Oreo OTA started hitting other Samsung devices as well. This includes the Note 8 and the Samsung Galaxy S7 and S7 Edge. Following the Exynos S7 variants, we are now seeing Android 8.0 Oreo for Snapdragon variants as well. Although the manufacturer may have briefly halted the official stable Oreo update for the flagships, its predecessors are now receiving Android 8.0 Oreo builds. If you have been following us lately, then you may know that there is a leaked Oreo build available for the Samsung Galaxy S7 and S7 Edge. Developers have successfully compiled the leaked Samsung Experience 9.0 build and made a TWRP flashable ROM for the same. So the Exynos variants of S7 Edge users can update their devices to Android 8.0 OS. Read: How to update Galaxy S7 Edge to Oreo? Now, the Snapdragon variants of Galaxy S7 and S7 Edge with model numbers SM-G930A and SM-G935A can also enjoy the Android 8.0 Oreo update. AT&T stores the next (or unreleased) OTA updates onto their servers. Users of the S7 device have captured the unreleased Oreo OTA builds from AT&T and made them public. So download and install the OTA from below. This tutorial will show you how to download and install the new Oreo firmware update with build numbers SS-G930AUCU4CRD6 and G935AUCU4CRD6. Download Galaxy S7 full Stock Firmware directly from Samsung Servers! Older Beta updates: CRD6 Oreo OTA is available for download for Galaxy S7 and S7 Edge. The following OTA updates have been captured officially from the AT&T servers. Remember that these are only for the AT&T Galaxy S7 and AT&T S7 Edge variants. It may not work with other devices. These are OTA update. You can either flash them using ADB sideload method or using the stock recovery method. Both will work. 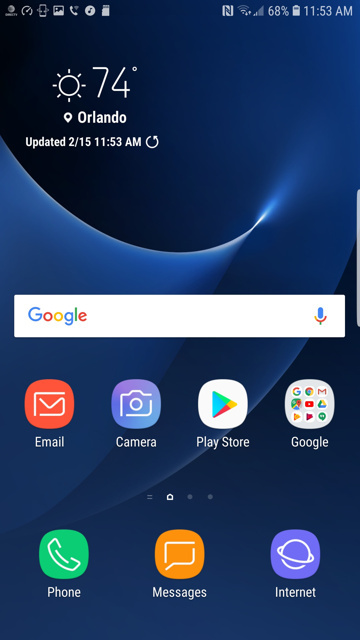 As seen in the screenshot, the software version is Android 8.0 based on Samsung Experience 9.0 and features the January 2018 security patch. How to Update Galaxy S7 Active to Samsung Experience 9.0 Android 8.0 Oreo? Samsung Galaxy S7 Active gets Android 8.0 Oreo with G891AUCU3CRG2. Download OTA update zip for S7 Active Oreo below. In order to update, to the latest July 2018 Android Security Patch, your device needs to be on the previous base firmware build G891AUCU3CRE7. Visit S7 Active full OTA downloads repository from here. Once downloaded, head over to installation instructions section. You may also need the full stock firmware files to flash via Odin tool. Make sure your device is running the latest Nougat firmware update G891AUCU3CRE7 for S7Active, in order to get to the latest G891AUCU3CRG2 firmware update. Download and install the latest firmware from this tutorial and install via latest Odin. Next, download the latest Oreo OTA updates from above. Transfer all the files to device storage internal or SD card. That’s it. Let us know how the update works for you in the comments section below. una pregunta amigo mi s7edge (sm-g935a) no me deja actualizar a ninguna version para lograrlo segun necesito un sim at&t para poder hacerlo otra pregunta si quiero actualizar a esta version y tengo la version de mayo 2017 que pasaria se puede hacer o que tengo que hacer ? una pregunta, cuanto tiempo se lleva la instalacion, porque ya instale android nougat la que marca hay, despues ise lo que indica, entrar al recovery stock y instalat oreo asi como lo indica, llevo todo bien, pero mi telefono lleva ya como 20 minutos desde que le di instalar y no acaba la instalacion, se queda en “patching system files” y pues no se que hacer, Ayudaaaa!! puedo instalar la version nueva G935AUCU4CRE4 encima de esta o tengo que instalar primero G935AUCS4BRA1?